Recently I was approached by WaterWipes to try out their pure baby wipes. Now that I am a parent, types of wipes and nappies have become a small focus in my every day life & picking the right products for my baby is important. I try to steer clear of wipes and lotions with all of the common nasties in them, so the shorter the ingredient list the better. And 'WaterWipes' pure baby wipes have just about the shortest ingredient list with only two components - water and grapefruit seed extract. Initially I didn't like the wipes, but after Romy ate a couple of dates with her lunch and they went straight through her I changed my mind. I used half the amount of wipes I ordinarily would require for a serious nappy change when using the 'WaterWipes', which was pretty impressive. I found the wipes to be a preferable thickness that makes them far more durable than the other brands of wipes I have used in the past. However, these wipes dry out a lot quicker and take on a cloth like feel. Romy has started to become quite difficult when she is having her nappy changed and likes to roll over on the change table. There were a handful of times that I would have her new nappy and wipes pulled out to the side, set up & ready to go, but her persistent rolling would turn a one minute task into a five minute ordeal and the wipes would be close to dry when I got around to using them. 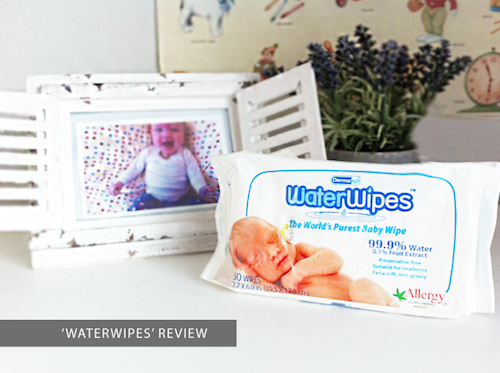 Overall I liked the 'WaterWipes' - they are a preservative free, non greasy, pure baby wipe that is allergy friendly and durable. I used less wipes when I was trialling this product, and Romy didn't get any nappy rash whilst using them. But at the end of the day, these wipes are the most expensive option at the supermarket for $7, and that is quite a lot to spend on wipes in my opinion - especially when I have the choice at my local supermarket of two other brands of chemical free wipes that are considerably cheaper. I have however purchased these wipes after my trial pack ran out, and have noticed these wipes on sale a couple of times since. So I will definitely use them again! Checked out their website and they make make-up remover wipes so I'll DEFINITELY be checking those out. My face is allergic to like everything so these sounds great. As for wipes for my daughter, that is pretty expensive. I use chemical free wipes already that are a bit cheaper than that but still expensive too. Actually, in US dollars they are the same as the wipes I already buy so I'll check them out for Lyla too! They are definitely a great baby wipe but when it comes down to it, my regular wipes are a good $3 cheaper and are chemical free also. So I'll most likely only purchase the WaterWipes on special. I would be interested in their make-up removing wipes, so I'm going to go check those out too!